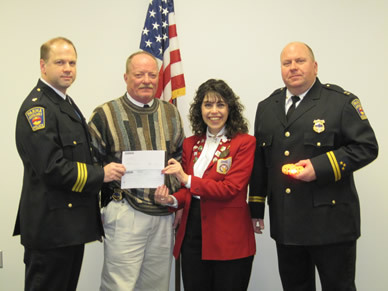 The Parma Auxiliary Police accepted two $750.00 grants from the Parma Elks Lodge #1938. This first grant was used to purchase radio ear pieces for our members. These will allow Auxiliary Officers to hear radio communication better during load events and day to day operations. The second grant will be used to purchase electronic flares that will be used when Auxiliary Officers are directing traffic. In testing these " Tiger Flares" have greatly increased the visibility of a barricade and thus increasing officer safety. Are you interested in law enforcement? Click here to learn how you can help your community be a safer place to live. Click here to see our Auxiliary Officers serving our community. The Parma Auxiliary Police serves to support the Parma Police Department. Our volunteer officers assist the full time officers with traffic control, serve as partners on patrol, and provide security at city and school events. Left: Auxiliary Police thank the Parma Elks Lodge #1938 for the grant money. On Monday, December 13, 2010 the Parma Auxiliary Police welcomed 4 new recruits.